Background: Acetaminophen (aka APAP, paracetamol) has been used clinically since the 1950s and is one of the most widely used and trusted analgesic and antipyretic medications available. In addition to being available over the counter, it is present in numerous combination cold and pain medications. Over 130 million prescriptions were written for such compounds in 2010 alone. 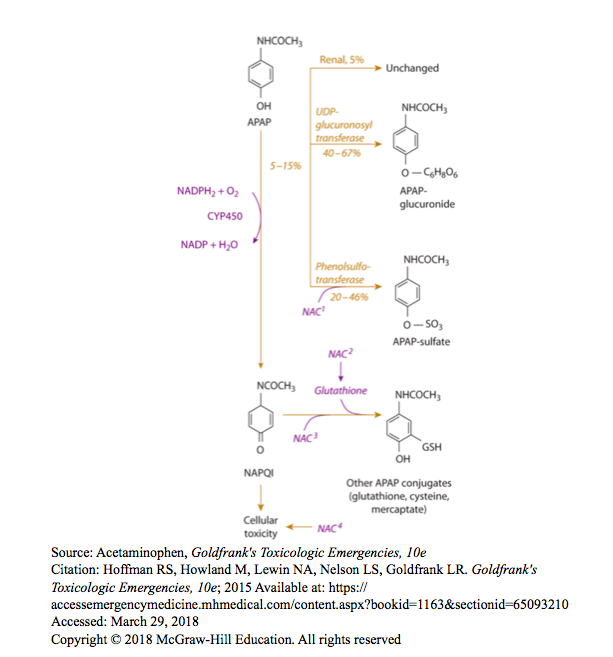 APAP overdose can be broadly divided into simple acute ingestion, wherein the evidence is strongest and the Rumack-Matthew nomogram is applicable, and cases with confounding factors, wherein expert opinion dictates practice. 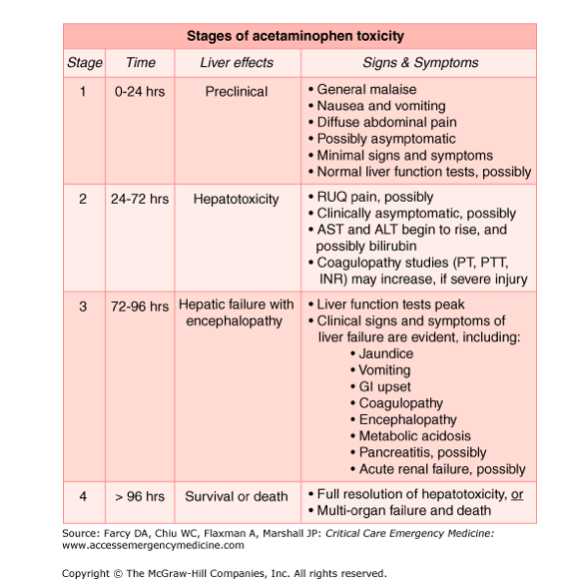 Key Point: The first stage of APAP toxicity is largely silent. Although there may be general malaise, nausea/vomiting, and abdominal pain, there may also be no symptoms (including normal LFTs). 24 hours: Transaminitis and possibly coagulopathy. Other causes of acute liver failure: alcoholic hepatitis, drug/toxin-induced hepatitis, viral hepatitis, shock liver, etc. Empirically derived by plotting untreated patients with acute APAP ingestion on the graph above and dividing those who developed hepatotoxicity from those who didn’t (defined as AST/ALT >1000). 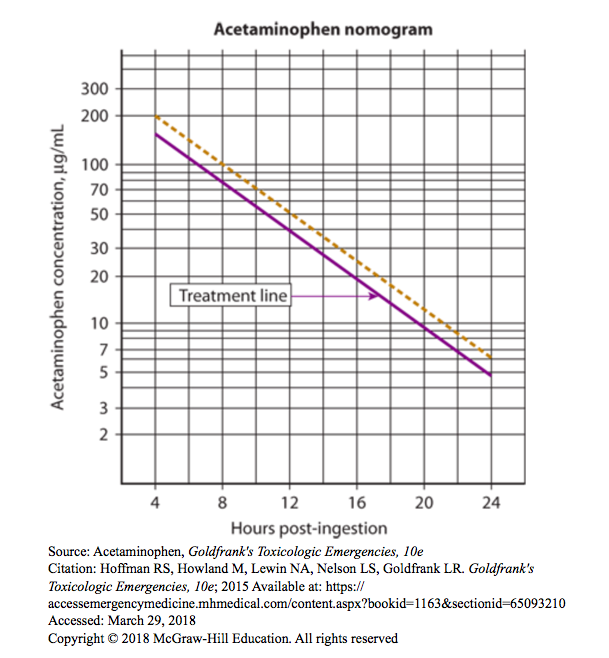 This approach led to a “300-line” from [APAP] =300 at 4 hours to [APAP]=50 at 12 hours (not pictured above) dividing patients with hepatotoxicity and those without. Threshold initially lowered to a “200-line” from [APAP]=200 at 4 hours to [APAP]=50 at 12 hours (dotted yellow line above) to be more conservative. With this threshold, only 60% of patients above the line would go on to develop hepatotoxicity. If [APAP] is above the 150-line, treat with NAC as below. Multiple scoring criteria have been utilized to predict treatment failure/need for transplant/mortality. There are no reported cases of fetal or maternal toxicity in women treated with NAC within 10 hours of ingestion, however some women in this group had elective abortions (Wilkes 2005). Tintinallis Emergency Medicine: a Comprehensive Study Guide, 8th ed. New York: McGraw-Hill Education; 2016. Chapter 190: Acetaminophen.